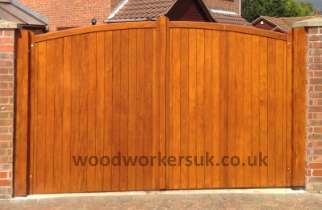 All our wooden driveway gates are made to suit the sizes you require – to fit your openings in both height and widths. 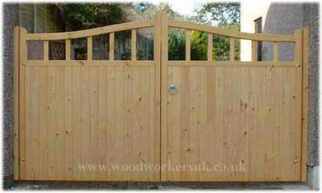 All gates are based on 70mm (2 3/4″) thick through wedged morticed and tenon jointed frame. For more information, and pictures of any of our wooden entrance/driveway gates below, please click on the respective images below, which will give you more information. As well as all our wooden gates being made to measure, everything can also be customised to your requirements. Wooden Entrance or Courtyard Gates? Although we’ve titled the page “Driveway Gates”, all of the timber entrance gates available in pairs here can be made to the taller Courtyard versions. Traditionally the Courtyard Gates are taller than their Driveway counterparts, but as we make to measure just let us know the height required! The Beaumaris wooden driveway gates are available in European Oak, Idigbo, Meranti (Hardwoods) and in Softwood. Featuring a 150mm (6″) rise, The Beaumaris driveway gates pictured are a fully boarded, high centre (rising to the centre) pair. The Beaumaris is also available as open boarded wooden gate and with a low centre (dropping to the centre). Our Curved headed timber driveway gates in Idigbo (Hardwood). The curve rises by 3” (75mm) from the lowest point to the highest, though other rises can be accommodated if you wish. This Curved headed driveway gates are also available in European Oak, Meranti (Hardwood) and Scandinavian Redwood (Softwood). 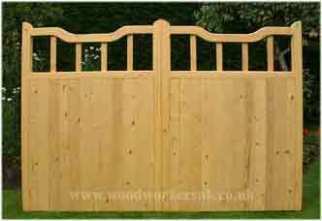 Our Curved headed pairs are also available as an open boarded gate and as a pedestrian gate. Available in European Oak, Meranti, Idigbo (Hardwoods) and Softwood, our Caernarfon wooden driveway gates feature a 150mm (6″) rise. Pictured in Softwood, fully boarded and with a high centre (rising to the centre). An open boarded version is available as well as a low centre version. The Harlech driveway gates feature an attractive curved underswept head. 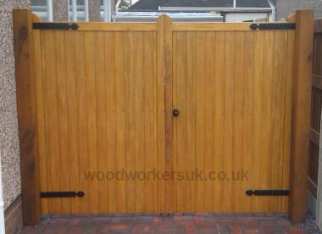 This is also available as an open boarded gate and as a pedestrian gate. Why not have the matching set outside your house? Shown right is a pair of our fully boarded Harlech timber driveway gates in beautiful Scandinavian Redwood (Softwood). Our stunning Harlech driveway gates are also available made to measure in European Oak, Meranti and in Idigbo (Hardwoods). 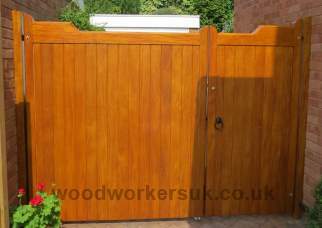 Right is a pair of our Bala driveway gates in stunning softwood. These are available made to measure to accommodate your preferences in European Oak, Meranti and Idigbo (Hardwoods) as well as in Scandinavian Redwood (Softwood). The Bala is also available as an open boarded gate and also as a single pedestrian gate. How good would your home look with these in the driveway? 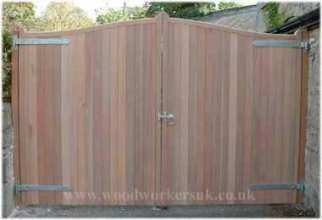 Shown left is a pair of our St Asaph made to measure driveway gates in Scandinavian redwood (Softwood). This simple design is available made to measure in European Oak, Meranti and Idigbo (Hardwoods) and Scandinavian Redwood (Softwood) and features a straight rail along the top. The St Asaph is also available as an open boarded gate and also as a single pedestrian gate . Why not order these for your driveway? Contact us for more details and to discuss a personalised costing for your home. Shown right is our close boarded Colwyn pair in Meranti (Hardwood). The Colwyn drive gates feature an elegant sloping head that rises 6″ (150mm) from the lowest point to the centre. As with all our driveway gates, these are also available made to measure specifically for your specifications in European Oak, Idigbo (Hardwoods) and Scandinavian Redwood (Softwood). The Colwyn is also available as an open boarded gate and also as a single pedestrian gate . Like the look of these? Please contact us for more information. Our Nannerch wooden driveway gates in Meranti (Hardwood). The Nannerch driveway gates feature a diminishing gunstock head that drops a total of 2 3/4″ (70mm) from it highest point. As with all of our gates the Nannerch driveway gates are made to measure (in both height and widths) and are available in European Oak, Idigbo, Meranti (all Hardwoods) and Scandinavian Redwood (Softwood). The gate pictured here is a wooden driveway gate with pedestrian access, sometimes referred to as a wooden driveway door. Nannerch driveway gates are available with a matching pedestrian gate. Pictured right is a pair of our Denbigh wooden driveway gates in Idigbo (Hardwood). This simple design is available made to measure in European Oak, Meranti, Idigbo (Hardwoods) and Scandinavian Redwood (Softwood). 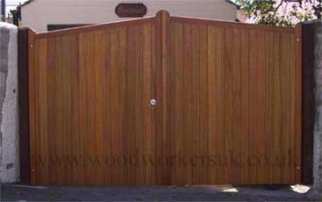 These gates would ensure complete privacy and security for your home. The Denbigh is also available as an open boarded gate and also as a single pedestrian gate . Have these caught your eye? Contact us to find out more! If you are after something a bit different or individual, or maybe you are trying to match to existing wooden gates or fences and you have your own gate design in mind, then please see our bespoke wooden gates page for more information on how to obtain an individual costing and get a door manufactured to your own personal design. If you can sketch it, we can make it! As all our timber driveway gates (and everything else!) are made to measure, we are unable to issue a price list covering all the various height and widths combinations that we manufacture. 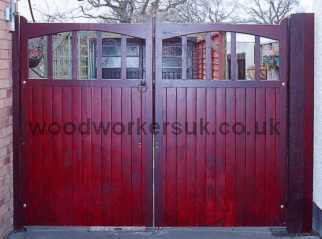 You can however get a guide price on any of our driveway gates in all the timbers we use by clicking on any of the pictures of the gates above. Obtaining a personalisled costing on any of our driveway gates couldn’t be easier, you can either use the contact form below (or on any of the individual driveway gate pages), give us a call us on 01745 362444for an immediate costing or pop into our workshops in Rhyl, North Wales. To get a personalised quote on any of our driveway gates you can either use the form below or the forms on any of the individual driveway gate pages (Click on any of the pictures above for more info on the relevant gates). 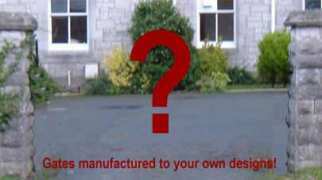 Do you intend to automate your driveway gates?